Meet your guide at either your Lisbon hotel or the Lisbon cruise port and begin your private tour with a drive to the beautiful town of Obidos. As you ride along in your luxury vehicle, hear old stories of the kings who protected this city’s strategic location by endowing it to Portuguese Queens. Arrive and admire this medieval city’s fortified walls that maintain the feel of its past royal heritage. With your professional guide, explore the streets of this historical town and ogle an array of charming white walled terracotta roofed homes. Notice the vibrant yellow and blue striping that segregate buildings and create an ideal contrast for photographs. Continue along and soak up the scent of sweet cherries as you pass by a shop that serves ginjinha, a cherry liquor served in an edible chocolate cup. Wander past the Church of Santa Maria near the main square, and come to the town’s gorgeous castle. 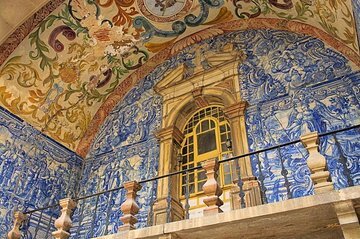 As you study the architecture of this stronghold, hear how this castle was converted into a Pousada so people could enjoy a taste of what life was like in medieval times. Afterward, hop into your vehicle and return to Lisbon where your tour ends.